THAT is a great, I think single line? drawing! Bravo, my favorite to date! Next year, A new sculpture each month for 12 months. Bet you could do it! THIS Sir, should be your new signature. That's a very interesting and creative exercise. And the resulting drawing is fantastic. I'm curious where'd you get the idea from? After trying several of the inadequate variety, I am left convinced that I have no words to describe my reaction to such a line as this. Only that I hope sobriety checkpoints never make it the standard of the sort of line one must walk. I really like this one, it's beautiful. 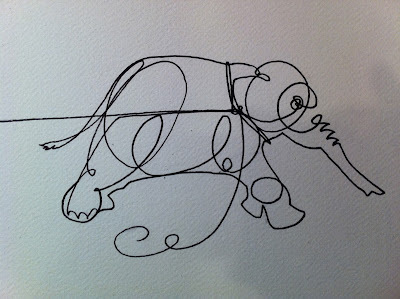 Maybe I am biased due to my love of elephants, but I think this is the best so far. I also love the style/concept. This was brilliant! You, sir, are incredibly talented. Wow! Echoing everybody else who thought this was the best yet, but I'm curious to know ... right-to-left, or left-to-right? Glad you all like it! I think it's my favourite so far. Cringing Wretch - I completely nicked the idea from, er, Picasso. (If you're going to steal, steal from the best.) Google his one line bull-fights, they're incredible. Mr Finnemore, that is incredible, definitely my favourite! So not only do you have the talent to write THE funniest radio series ever, you're also ridiculously talented at art. No fair! Wow! Brilliant. Speechless second time. Are you sure you are Earthling? John: Ah, bugger. I should have gone for a hard cheese with holes; would have been easier to draw without looking like a cake. But here you go. Love this. I notice that guy on the end of team B is not pulling his own weight. 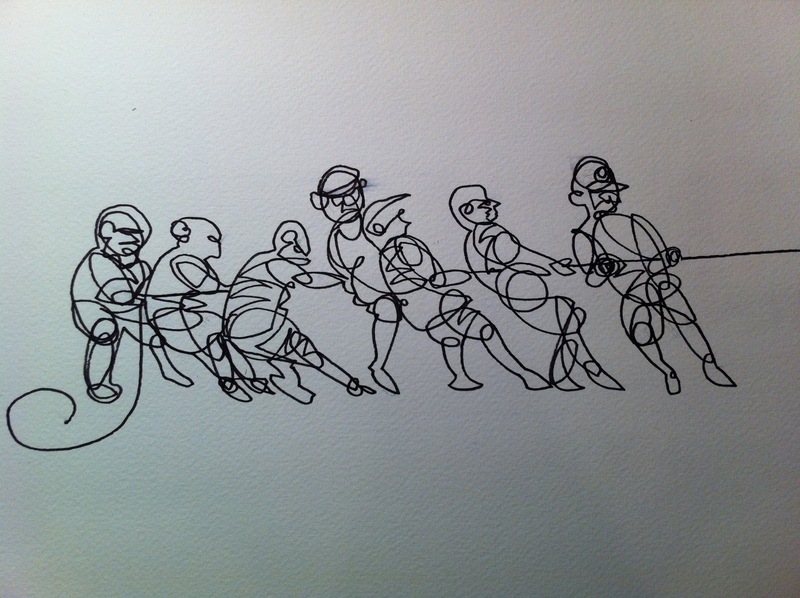 Or perhaps you sketched in a muscle sprain? I love it :) One line, that's impressive. I've tried to draw like that before and it looked nothing as amazing as this! OK, it's Christmas already with that one! i want that for my wall. i know just how that elephant feels. John...not bad eh! As an aspiring artist who wistfully goes through daily updates from eatsleepdraw wishing she had some talent, I applaud you for your efforts. Keep up the art updates and also the funny photos! Big fan right here! I feel slightly proud that I thought "Picasso!" the moment I saw this. Wow, this is amazing! If I admired your drawing skills until now I now downright envy them. Wow oh wow oh wow oh wow. I already was in awe of your drawing abilities but now I am simply astounded! 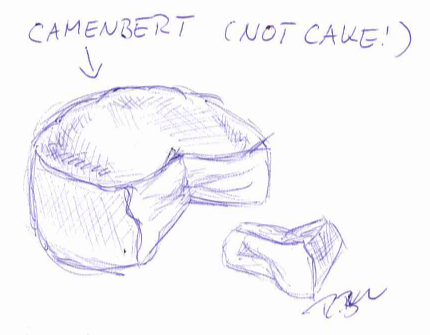 Rebecca - That's an excellent Camembert, and doesn't in the least look like a cake. Sarah - I'm very glad to be able to help, in however tiny a way. Hang in there - it will get better. It always does, eventually. You know what? 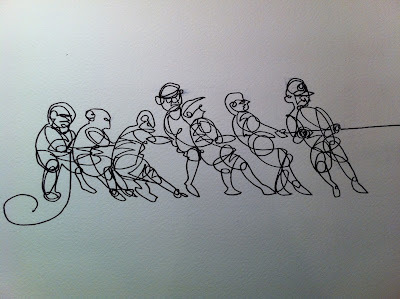 Single line drawings could be a good holiday activity! Every year I go slightly bonkers staying at the crowded relative's house, and every year, a creative activity is the cure. So what's the equipment needed here ... one pen! I refuse to believe you can't sing - we've all heard the zoo song!!!!! Oh wow, this is amazing... I can't even sign my name in a single line! I love, love, LOVE this! Can I buy it? Or at least, get hold of a copy? Pleeeeeeease? This is absolutely brilliant! And not because I'm coining that statement from Arthur. I just couldn't think of a better adjective for this. Have you done something like this before? Hope you could do another one like it. 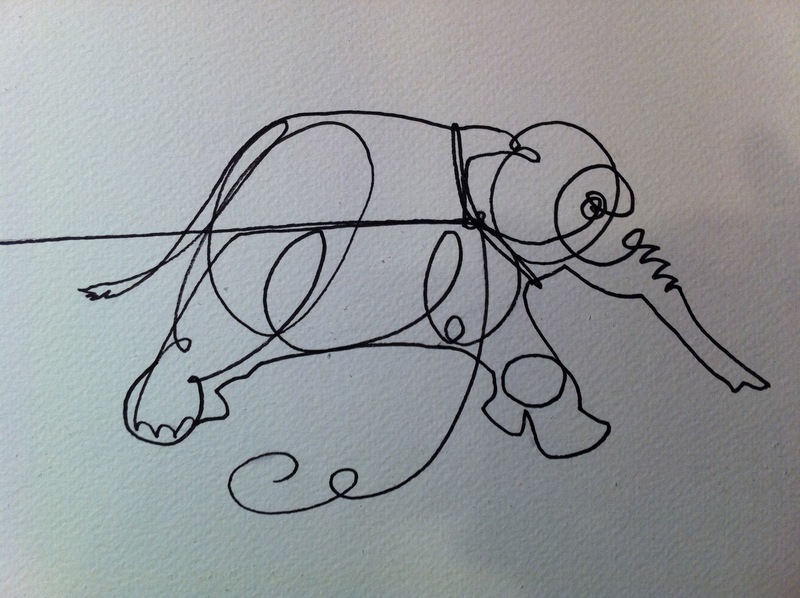 If you sold that curlicue of an elephant as a print I would buy it. Honestly. Not a chance you'd be selling prints of this, is there?